Siffonz.com is an online Pakistani and Indian artificial jewelry shop. 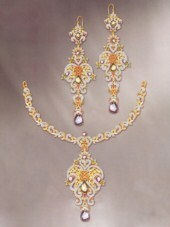 You can buy beautiful gold plated jewelry sets directly from Pakistan through our website. How can I order a product from siffonz.com? You can order a product from siffonz.com by selecting the product and then add the required quantity in your shopping cart. Then click on checkout button and enter your login details. If you are not registered with siffonz, you will need to create an account first. Then you can specify your shipping and billing details. Once we receive your order, we shall process it as fast as possible. How can I Pay for buying products? We accept all major credit cards/debit cards. All credit card payments are processed by moneybookers.com which is one of the largest payment processors in the world. All transactions are 100% secured. We also accept Western Union money transfer. We try our level best to ship your order as soon as possible. Once we receive the payment from you, we start processing your order. Usually it takes about 2 weeks for your required jewelry sets to be manufactured. After that it will be shipped to you through FEDEX/DHL courier service. Normal delivery period is about 1 week for most of the countries. So you should expect your order to be delivered to you in about 3 weeks time. We shall keep you informed about the status of your order through Email. I have transferred money through Western Union. What should I do next? Please email us the 10 digit MTCN number along with your Order ID. We will process your order, once we receive the payments from Western Union.